Aloha and welcome to Maui! Construction Disclaimer: Luana Development Parters LP will be building 72 townhomes in the area. The work will be in the empty grass field on the east side of Honua Kai (non-ocean side) beyond the path that circles the bowl between the two towers. These are 2 story townhomes. A fence will be constructed to limit dust and views of the work. Construction starts on Feb 5, 2018. Our rates reflect discounts for the construction. We have a collection of 16 beautiful Honua Kai condos in both towers. We have several one bedroom, 2 bedroom and 3 bedroom condos as well as a one bedroom with a den. 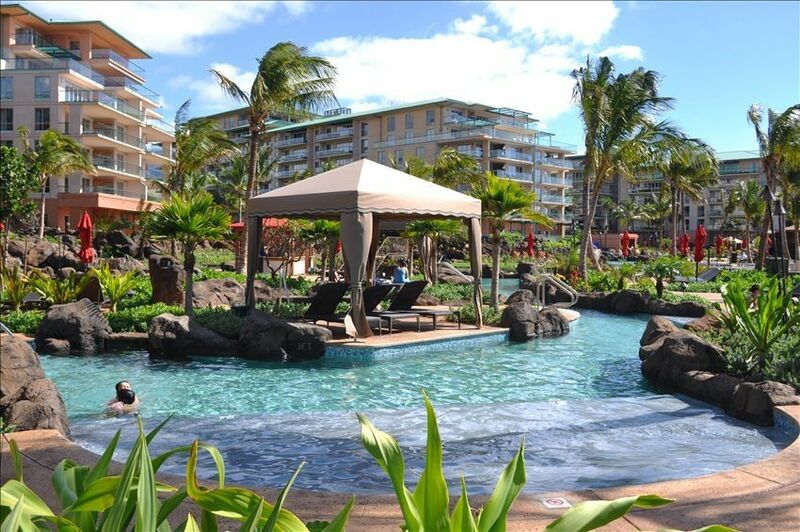 The Honua Kai (HK) resort is located at the northern end of golden Ka'anapali Beach, considered one of the world's best, warmed by the beautiful Maui sun and overlooking the islands of Lanai and Molokai. Honua Kai is Maui's newest beachfront ultra-luxury resort with dining, shops, activities desk and beautiful grounds spanning three swimming pools, waterfalls, exotic flower gardens and rolling greens. Dukes Restaurant is on the property. * Stunning oceanfront resort with spectacular breathtaking ocean & Maui hillside views! GORGEOUS sunset views with the sun setting between Lanai and Molokai! * Ocean view from the lanai! * Just a few steps from the ocean, hot tub & numerous oceanfront pools! * Gleaming new kitchen with Bosch stainless steel appliances & granite countertops! * Brand new bath with shower and separate tub! * Huge living room with plasma TV, and DVD player! * Designer tiled floors, with carpeted living room & bedroom! * 145-sq.ft. lanai for al fresco dining, w/doors opening up to the living room! * Best accommodations for 2 to 4 people. Ideal for families or couples! This luxury condo is in one of the best locations in Maui! It is beautifully and professionally designed to help you relax and enjoy your Maui vacation. It is the perfect choice for a romantic escape - or for the family trip of a lifetime. • $24.95/Day Plus Tax Amenity Fee includes parking for one car. The view from your Lanai includes a spectacular show of humpback whales from December thru April. The sights are ever-changing - with sailboats, cruise ships, snorkelers, turtles, and sunbathers. Maui No Ka Oi means 'Maui is the best' - quite literally - for the best and most beautiful vacation you will have in your Kaanapali 'home away from home'. Aloha! Spacious bathroom has double sinks, separate shower and tub. We provide starter soap, shampoo, conditioner and lotion. Spacious and clean. Comfortable bed and nice linens. No surprises! We enjoyed our stay immensely! Love the Honoa Kai resort! This is our 2nd year to vacation at this resort and we are already planning on another 2 weeks next year. This unit that we stayed in was a good location and we were comfortable. Two areas for improvement though 1. The carpets and upholstery were dirty. 2. The bathroom lighting was very dim. I think there is a short in the wiring as only one of the vanity lights would come on even after we changed bulbs. Also, the cutting board was moldy and we had to sanitize it before we dared using it. The new towel vending machines were a nice improvement over last year. The bellman and valet parking attendants were wonderful. We are glad that you had a good stay at our condo. We try to make it comfortable and clean for our guests. This condo is cleaned regularly and receives a deep cleaning on a regular schedule. Regarding the lights in the bathroom; the dimmer switch may have been turned down. When we went to check the bulbs we also found one to be loose. After fixing these items the lights worked well. Regarding the cutting board, this was not brought to our attention during your stay. If so we could have replaced it, as we have done now. We loved the resort. I would definitely stay at this resort again. The pools were amazing, kids & adults loved the water slide. Snorkeling off the beach at the resort nextdoor was awesome. Dukes restaurant was great. The condo was really nice, very clean. Perfect for my husband and I and 2 kids (6yo & 9yo) Plenty of beach/pool supplies. The kitchen was nice, but very limited on supplies. They provide all the basic kitchen tools/utensils, but anything above that is limited. Bring your own containers if you want to save any leftovers. The only "disappointment" was that there wasn't the beach-view I had anticipated. You cannot see the sunset from this room. You can see the ocean, but the main view is of the condo across the lawn and the construction. If that doesn't bother you- than I highly recommend this condo. We are glad that you enjoyed a great stay at our condo. The condo has a partial ocean view as advertised, and the pictures are taken from the condo. This condo does have a view over the Luana construction site, and this is disclosed and our rental rates have been reduced accordingly. Sunsets are often visible from the condo, but that depends on the time of year.. Perfect accommodations, super clean, everything we needed. Can’t wait to go back! Very well appointed condo in an upscale resort hotel on the beach with a view of the ocean . This unit was perfect for our vacation to Maui. Well maintained and supplied condo high up in the resort with a view of two surrounding other islands. It wa a nearly perfect vacation. Highly recommend for a couple to enjoy the Maui paradise.